Log in to add your comments. How do you add your comments here? 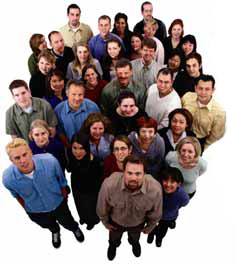 "SOS Computer Services is absolutely the best resource for the small office business network. We have a small network, and all the computers had some version of malware and other bad actors in them. This despite the fact that we are fanatic about computer security, antivirus and 'safe surfing'. Lou came and cleaned things up in a thorough, professional manner. Lou has also done computer maintenance on a "rush" basis, replacing hard drives when they catastrophically crash. He even loaned us his laptop to make sure we were not 'stranded'! Call Lou for all your computer and network needs. He'll take care of the situation, and you'll be pleased with the result. Jane Krayesky, IdentityImpact LLC"
"There isn't anyone more knowledgeable than Lou, he truly knows his computers. His response time is quick and he is the only person I know who gives a call back to make sure the repair is still working. SOS should be very proud to have a technician like Lou representing them. I strongly endorse SOS and especially Lou and highly recommend them to my family and friends that need computer repair services. " "Lou, just want you to know we were very happy with your service. It is great having our computer up and running the way it should. I hope we will not need to call for service again, but if we do, you will be the one we will call. Thanks again. Pat"
"Thank you so much for the excellent service. Great service and a very reasonable price." "Lou is a master of computer science and this gives a client great confidence in his work. Since time is part of his stock in trade it is also very encouraging that he works at an astonishing pace. A delightful man, very personable. I highly recommend him to you." "I met Lou at a Women's Council Of Realtors Tech Expo and he was just what I needed. I had email problems that just kept getting worse. Other people including tech support tried to help but in their attempt to fix created new problems. Lou was great, he "listened" to me and fiqured out the many email problems. It is great to know that I have my own personal IT guy. Thanks Lou "
"A total excellent experience. Lou picked up both of our laptop's at my home, to my schedule and had both of them repaired in no time and delivered both of them back to my home, again to my schedule. He explained the problems in detail. I will be using his services for my office computers in the future and I highly recommend him to everyone in Ocean County for their computers." "SOS Computer Services (Lou) was the best phone call I ever made. I can only describe my previous computer experience as a nightmare. I dreaded turning the darn thing on. Lou cleaned up my computer and has it running perfectly. Now the "thing" is a pleasure. " "SOS is a top-notch service that answered all my questions and got me up and running in no time when my computer failed. For a speedy response and excellent quality of work, I highly recommend SOS." "Thank you, SOS Computer Services, LLC is the BEST! The diagram you sent is very helpful, I think this office should use SOS at all times." "Recently Lou came to our home to transfer all information from my old computer to my new computer. Not only was he able to service our computer immediately,he was able to accomplish the job in the time he stated on the phone. He was professional,efficient,and personable as well. I was truly impressed. I would highly recommend him to anyone needing help with their computer problems. What a convience to have Lou to your home as well! Thanks Lou!" "Lou is the BEST! I made a terrible mess on my computer and I called Lou to get me out of it! He responded right away. He had it fixed and up and running in no time! This man saved my marriage. My husband couldn't read his Football Board and was not happy with me. Now, my husbandloves me again and, he loves Lou, too! :):):) I used to be terrified wondering what I would do if I needed serious computer help. I'm at ease now,because I know I have someone responsive, reliable and expert in what he does, to help me out! Thanks so much Lou. I have recommended you to everyone I can think of. " "Lou is terrific. He came over the same day I called and fixed the problem. In fact, my computer runs better than it did before. I plan to recommend him to my friends - many of whom are as helpless on their computers as I am." "I had been struggling with issues with my computer for some time now. After calling technical support repeatedly and being charged each time, I was resolved to the fact that my computer was never going to run efficiantly, ever. We recently switched providers and I thought that would resolve at least most of my issues. Realized it didn't, and I had to resort to a smarter way to solve my computer problem once and for all. I opened the phone book and began making calls to various computer help services. After the third call and feeling the most comfortable,I was able to make quick and convenient arrangements with Lou to come to my home, which I thought was great, and make my computer well again. Just under two hours later, he did what he promised, resolved my computer issue with a courteous and professional manner. I felt very comfortable and at ease with Lou and I told him I would defenately recommend him to all my friends and clients. His rates are affordable and he comes well prepared. Not only did he resolve my computer issue but also educated me about computer use that I wasn't aware of. He is a genuinely fair and decent person and truly takes pride in what he does." "INTELLIGENT, KNOWS HIS TRADE EXCEPTIONALLY WELL, EXCELLENT PERSONALITY. VERY RESPONSIVE TO CUSTOMER'S NEEDS, PROMPT IN RESPONDING. OUTCOMES EXCELLENT. VERY TRUSTWORTHY AND FAIR. I WAS FORTUNATE TO COME ACROSS LOU AND HIGHLY RECOMMEND HIM TO ANYONE INTERESTED IN THE ABOVE CHARACTERISTICS." "Just wanted to thank Lou for all his help and patience. I will certainly recommend you to my friends. Betty"
"Lou, just wanted to say "Thank You" for your reliable and efficient service on our computer. We received our new monitor yesterday and are back in business, thanks to you. You always solve our problems so quickly. I highly recommend you all my computer friends. Thanks again, Lou. " "I was attending school at an online University when my computer failed with all my work on it. Lou was fabulous, he retrieved all my hours of work and had me up and running in one day. I could not have completed this difficult course without his help. I felt comfortable having him in my home,and would use his services exclusively from now on." "Lou is a marvel, a genius, the ultimate in experts!!! He took one look at our old, near-dead computer and in one hour brought it back to live again!!! We are seniors, not computer-literate, reliant on this antique Compaq for e-mail, research, etc. and he understood our needs. We would recommend him without question...he is pleasant, ethical, honest, and, once again, a GENIUS!!! Thanks, Lou...."
"Thanks so much SOS! I thought all my data was lost!! I had years of pictures and documents saved on my hard drive, and one day, the computer wouldn't start. I was in a panic, until I met SOS. They were able to save all of my data!!! What a lifesaver! Thank you again." "S.O.S (Lou) It has definitely been a pleasure meeting you also. And I want to say Thank -You sooo much for coming over so quickly and getting my computer up and running BETTER than ever. I can't tell you how happy I am just knowing that I finally found someone that I fully trust for all of my computer issues. Your service and knowledge...awesome and your prices...just great!!! A++++++ See you again , my friend! =) "
"Lou, Thanks for your timely response and knowledge towards my problem. You were quick and very efficient. I would recomend you to all my friends and co workers. Thanks, John and Laura M. Bayville, NJ"
"It has been said that one should not pick doctors, dentists or computer services out of the yellow pages. I am so glad that I did! Lou and SOS are the best thing that ever happened to this senior citizen novice computer user. He's great! " "I was having problems with my computer, had SOS come by the house and was up and running in less than an hour. Very knowledgable and the best at troubleshooting, you won't find better! Highly recommended!" "Excellent service, on time for appointment and follow up turn around call was prompt. A trustworthy businessman who takes pride in his work. I recommend him highly!" "Thank you so much SOS! Finally, after many unsuccessful frustrating attempts, we have found fast, dependable, professional help for our computer needs at SOS - without leaving home. You have us as customers for life!" "SOS did a really great job at a very reasonable price for what I needed. And it was done in a very short time. Thanks for keeping in touch to make sure that everything is still OK or if I still need assistance"
"Service was prompt and honest. Computer is working great and the upgrades you added was a pleasent surprise, Thanks I will recommend you to anyone and have! " "It's a shock when the computer goes down or doesn't respond, and you don't know what to do, or where to turn. We want to say THANK YOU for your quick response and the great job that you did. We have been up and running since last July with no major problems. I always keep your number close by just in case that day comes along again. " "It was a pleasure dealing with Lou. Not only was he knowledgeable, he showed a computer novice like me patience and understanding throughtout his visit. I would recommend SOS to anyone needing service. " "SOS is terrific. Lou is thoroughly professional and keeps his promises - he had my computer fixed and working right just as he promised. I strongly recommend his services." "Prompt, courteous and dependable service in our home. 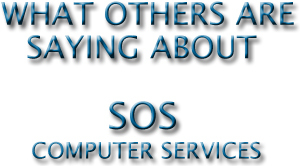 It's nice to know that when you have a computer problem you can rely on SOS. We would recommend you to anyone with a computer." "Lou, Thank you for your help. My computer is running perfect after you fixed it. If I should have any more problem I will definetely call you for your excellent service, and I will refer SOS to all my friends. " "Having had experience with a number of so called experts in the area, I was fortunate enough to learn of SOS. Help was swift and and the problem corrected. I now find that when I have a problem I've come to rely on SOS." " SOS Computer was only a phone call away when my pc was in desperate need of repair. The staff made sure they over-exceeded my expectations. Once the problem was taken care they remained in contact with me to make sure that no more glitches popped up. Outstanding service and a great piece of mind. I would highly recommend SOS. " "Thanks for getting my computer up and running again-I would recommend you to anyone because of your reasonable prices and really fast service." "I can't say enough about SOS computers! I use them all the time. I have 3 computers and two teenagers. We could never have been up and running without Lou. He gives fabulous fast service. No problem too big or too small. I recommend SOS to everyone who is in computer distress. I'm sure you'll be as glad as I was to find Lou." "Your services are exceptional and so convenient for anyone who has a personal computer at home. Just one phone call and your computer problems are fixed. I have recommended your services to all my friends for your excellent knowledge, quick repairs and affordable charges for your services. You are #1 for us. " "The staff at SOS is reliable, trustworthy and very professional. My experience in dealing with them for computer repair and website creation has been excellent. I highly recommend SOS for all computer problem solutions as well as instruction on systems and how to get the most out your equipment." "Computer is running better than ever!! Thanks for all your help!"